Weather Planning – EHFC Members Talking! I was always interested in the weather even before I became a pilot. Once I started my flight training I became, like most pilots, a weather geek. Clouds and rain for our ground bound brothers means maybe bringing an umbrella, for us it is much more important. One of the things I always love to do to improve my weather knowledge is to look at the available weather information and make my own weather forecast. I would try to plan a flight several days off and then see how accurate my prediction was. 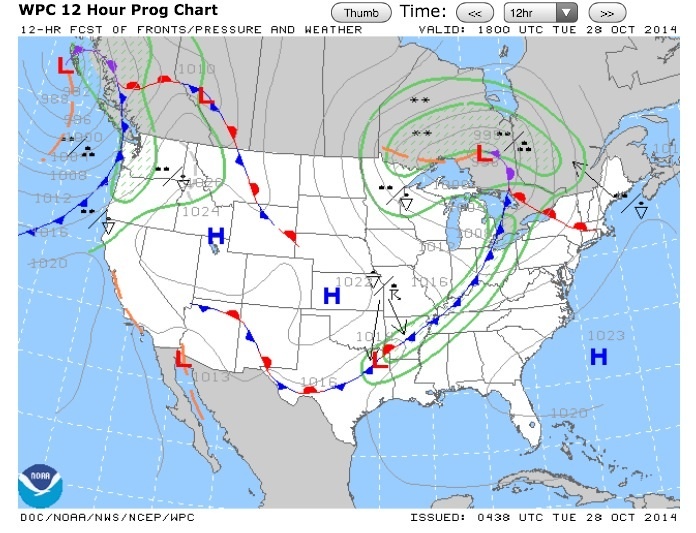 One of the first things a student pilot realizes is that the big “L” (low pressure) on the weather maps means a greater chance of canceled flights. So let’s take a look at some surface prognostic “prog” charts for the next couple days. To start the discussion I ask our VFR and IFR student pilots the following questions to hopefully get a better understanding of what happens when the big “L” gets close. Base your comments on just the prog charts. The forecast temperatures today are going to be near 70 degrees. Why? Do you think it would be smart to go flying this evening. Why? Where do you expect the winds to be from Tuesday into Wednesday this week? Why? Comments are welcome from all our members, students or not. I find that I learn something new every time I discuss the weather. — we are currently in the warm sector of an approaching low front. 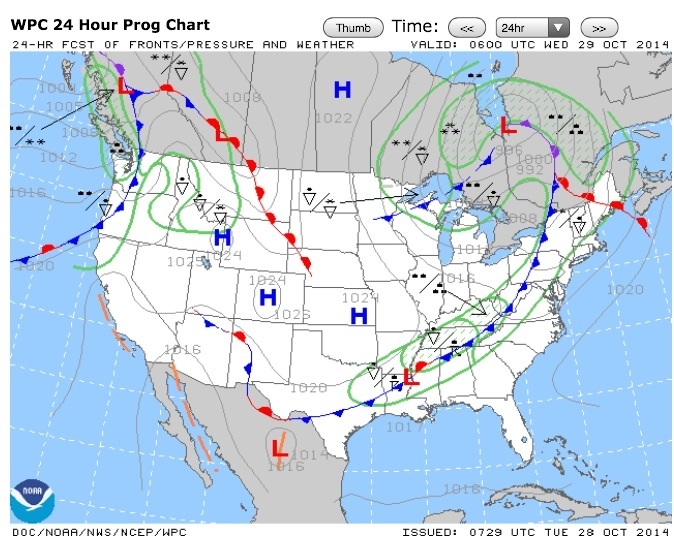 Lows turn due to coriolis effect sucking in air like a whirl pool and it’s currently pulling warm area from a southern air mass as it turns. 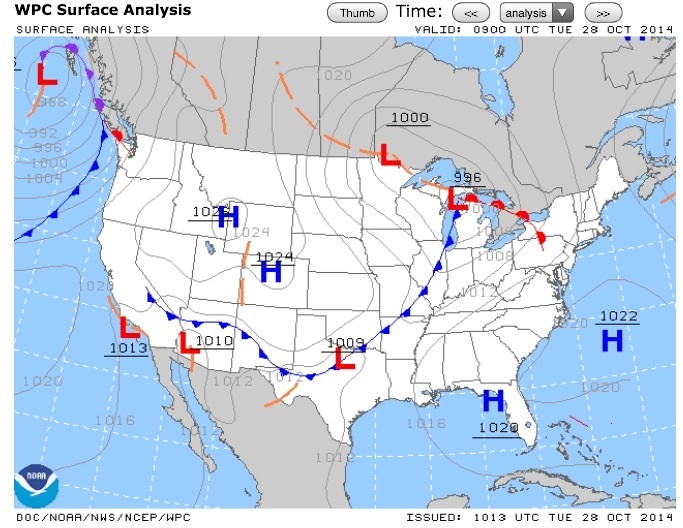 — probably not… it looks like the low front “a line of differeing pressures” is passing tonight. Front passage can bring shifting higher winds and more voilent weather depending on the amount of pressure change and some other forces. Ie lift, humity and such. — the wind direction will change as we move to the back side of the low. The low will be pulling from a more northly air mass as it passes over us, also dropping temps. Good analysis Ginny. Big “L” not good for flying! Thanks Ginny and as David said nice analysis. For our VFR and IFR student pilots that might not be that familiar here is a good article from last months AOPA Magazine. With a Low Pressure off the coast of New Jersey we are in the “cold sector”. The METAR at KITH is “KITH 021556Z 34015G22KT 10SM BKN025 OVC035 02/M03 A3013 RMK AO2 RVRNO T00221033 PK WND 34027/1510 SLP215” and snow is forecast in New England for the Patriots-Broncos game. Questions and comments are welcome. Enjoy the game and stay warm.